When Joe chooses HOW TO WRITE NEATLY as his project, clever clogs Chester says to Miss Tate: "I think we're talking high hopes here." Chester Howard can't believe it! He's been to all sorts of schools as his mother's jobs moved round the world, but never anywhere as awful as Walbottle Manor (Mixed). Everyone's so horribly nice, recommending him for blackboard duty, playing little skipping games at break. It's just awful. And Chester just has to get to work on the boy sitting next to him, Joe Gardener. He knows he's clever - Joe can build incredible models - but he can't get to grips with his school work and his desk is a mess beyond belief. Miss Tate's 'How to...' projects supply Chester with an opportunity, and he starts Joe on a subversive project 'How to Write Really Badly'. For once, instead of battling through work he just doesn't begin to understand, this is something at which Joe excels. And Chester has his own project - he makes sure Joe's amazing technical abilities get a class award, and creates a book where Joe can mark off every one of the 1646 days he has left of school, before he can be free to do the things he's really good at. Winner of Nasen Special Educational Needs Book Award 1996. Shortlisted for the Sheffield Children's Book Award, 1997. Shortlisted for the Stockport Schools Book Award. "Anne Fine - infectiously funny and highly readable." 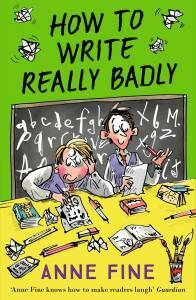 How to Write Really Badly is a book for children in the middle age range. It was first published in 1996.